IRT White Plains Road Line at Jackson Avenue. Photo by: Richard Panse, October 2009. 5.9 West Farms Sq.-East Tremont Ave.-177th St. Under "Contract I" of the subway work, the Interborough Subway was to have a branch under Lenox Avenue, continuing into the Bronx via tunnel and elevated structure to Bronx Park. The Contract I construction is covered in-depth elsewhere on this site (see: The First Subway). 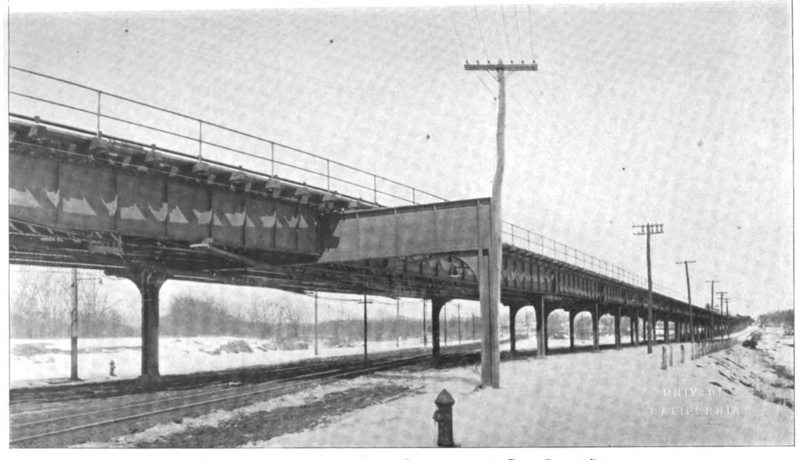 The elevated structure was actually completed prior to the subway, and was connected to the Third Avenue Elevated line to begin service. Further from Bronx Park, the extension through East 180th Street to White Plains Road was constructed as part of the Dual Contracts. The White Plains Road extension service began in 1917. New York Subway Extension Opened.- The Interborough Rapid Transit Company began operaton on March 3 as far as 219th Street of the White Plains Road extension of the West Farms branch of the first subway. Operation is by means of four-car trains composed of composite cars formerly operated on the underground portion of the first subway. A change is necessary to and from the White Plains Road trains at the 177th Street station on the West Farms line. The remaining stations north of 219th Street to the terminal at 241st Street will be placed in operation within the next few months, when an express service, which will not be attempted at first, will be begun. The White Plains Road extension is a three-track elevated railroad branching off from the West Farms division near 179th Street, crossing the Bronx River, extending over streets and private property along the east side of Bronx Park and thence by White Plains Road to 241st Street or Baychester Avenue near the northern city limits. 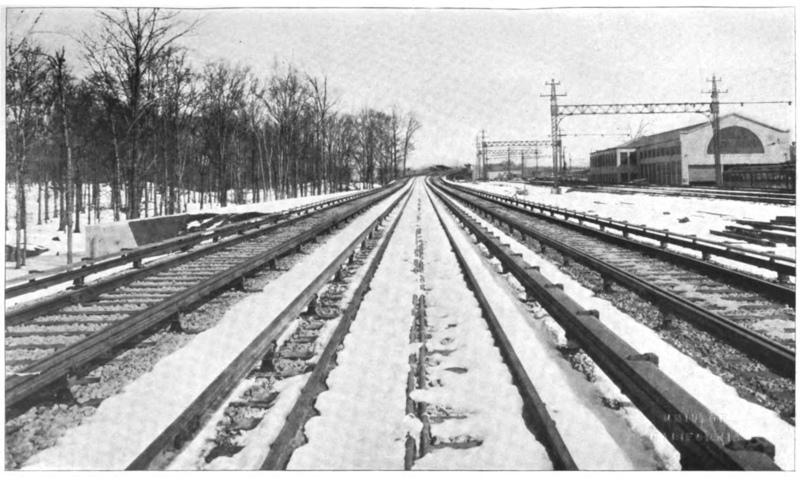 The line is 14.6 track miles in length or the equivalent of 4.8 linear miles. There are eleven stations on the line. The line has cost to construct approximately $2,750,000, exclusive of the equipment which is being installed by the operating company. The contracts for the construction of the extension were let early in 1914 and the line has required approximately three years to complete. Electric Railway Journal, March 10, 1917. In addition to the short connector to the 3rd Avenue El along Westchester Avenue, another connection to the 3rd Avenue El, known as the "Bergen Cutoff", opened in 1918 as part of the Dual Contracts expansion of the 3rd Avenue El. Heading southbound, two tracks split off from original Westchester Ave-3rd Ave connector at Bergen Avenue, turned south along a private-right-of-way, and joined the 3rd Avenue El at 143rd Street as an upper express level. New York, N. Y. — The Public Service Commission, First District, has approved the form of contract submitted by the Interborough Rapid Transit Company for the construction of a portion of the West Farms subway connection. This section, which is authorized by the dual system contracts, leaves the Third Avenue elevated line at about 134 ft. north of the center line of East 143d Street, and runs through Willis and Bergen Avenues to a point near 149th Street, and thence to a connection with the Lenox Avenue branch of the existing subway. It is authorized under the certificate covering the rights for elevated railroad extensions, and as such is to be built by the company at its own expense. The only condition attached to the approval of the contract is that the company must get bids from at least six responsible bidders and submit the bids to the commission for its approval. Electric Railway Journal, March 27, 1915. The Interborough Rapid Transit Company, on July 1 put in service the new West Farms subway connection between the Second and Third Avenue elevated railroads in the Bronx and the West Farms branch of the first subway. The connection extends through private property, Willis and Bergen Avenues, from 143d Street to the elevated portion of the subway. Actual operation began on July 2... when some twenty Second Avenue elevated express trains originating at Freeman Street were placed in service by this route. The new connection will relieve congestion at the 149th Street elevated station. Electric Railway Journal, March 27, 1915. The opening of service on the Willis Avenue or Bergen Avenue "Cutoff" extending between the express tracks of the Second and Third Avenue elevated lines in the Bronx and the West Farms branch of the first subway, which was announced for last Friday [June 1, 1917], was postponed in order to complete the signal service. This work will probably take a couple of weeks. The "cutoff" extends approximately from a connection with the Third Avenue line at 143rd Street to 150th Street and Bergen Avenue. It has been the custom for some time to operate elevated trains of the Second Avenue line to a connection with the West Farms branch of the subway which was made at Third Avenue and 151st Street. Under the new connection the elevated express trains of the Second Avenue line, which operate in rush hours as far as Freeman Street, will be switched over to the new connection. This will relieve the existing congestion at the station at 149th Street and 3rd Avenue, and in addition, it will no longer be necessary to use the grade-crossing connection at 151st Street and Third Avenue. New York Times June 3, 1917. Thru service between the White Plains Road IRT and the 3rd Avenue El was terminated in 1946, and the structure was removed in 1950. 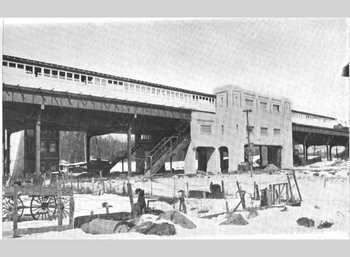 The 181st Street terminal was later cut back, due to objections over having the station so close to Bronx Park property, to a station at 180th Street, which opened on October 28, 1910. 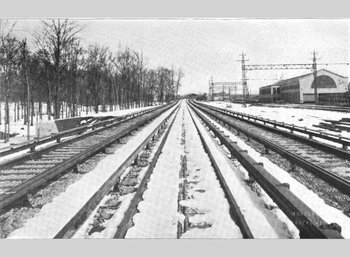 After the Dual Contracts extension of the line to 240th Street, the Bronx Park terminal was rendered mostly redundant and finally abandoned in 1952; the West Farms yard was torn down at this time as well due to new yard facilities at East 180th St./Unionport, and 239th Street. The Intervale Avenue station was added in 1910. Section 9A, 135th Street north and east to Gerard Street in the Bronx, including subway under Lenox Avenue, the Harlem River tunnels, and subway under East 149th Street. Work began July 10, 1901. This section also included the extension up Lenox Avenue to the yard and shops at 148th Street. The yard had 33 tracks and was the major yard on the IRT system. 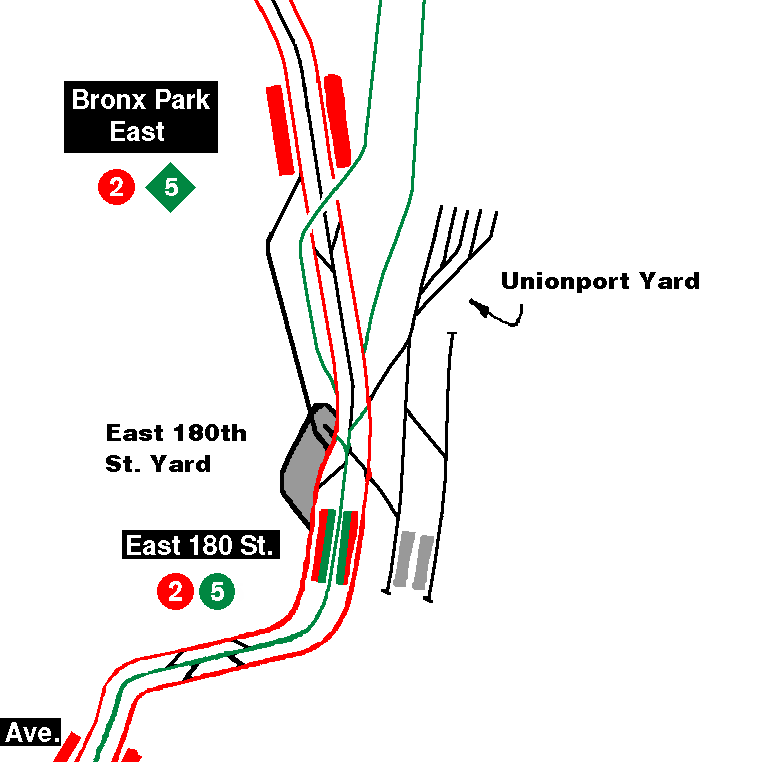 The junction of the yard leads with the line to the Bronx is a flat junction. The under-river tunnels were built by the cut trench method (as opposed to the shield method). The tunnels consist of a pair of prefabriated cast iron tubes, sunk and encased in concrete, and then backfilled on top with river mud. Stations included that at 145th Street, intended as a terminal with two side platforms. Trains not serving the Bronx would typically cross over south of the station and use the "southbound" platform for both boarding and discharging passengers. Trains bound for the yard would use the northbound platform. The northbound platform and surface kiosks were all signed "exit only." Conversion of 145th Street to a through station was done on May 13, 1968, when 148th Street-Lenox Terminal station opened within the grounds of the yard. Section 9B, In the Bronx, Gerard Avenue to just beyond Third Avenue under East 149th Street, cut-and-cover two track subway running 0.72 miles. Stations were at Mott Avenue-149th Street (now "Grand Concourse-149th Street") and Third Avenue-149th Street. The tunnel portal is located on a block surrounded by Westchester Avenue, East 149th Street, and Brook Avenue. Mott Avenue-149th Street station was constructed inside a large open cut, covered with a large concrete arch. The west end of Mott Avenue station was later cut off to allow a track connection from the Dual Contracts Lexington Avenue subway to be connected to this line. Work commenced June 13, 1901. Section 10, 3.13 mile long, three track steel viaduct from the west side of Brook Avenue to Bronx Park at 181st Street, running over Westchester Avenue, Southern Boulevard, and Boston Road. Stations at: Jackson Avenue, Prospect Avenue, Intervale Avenue, Simpson Street, Freeman Street, East 174th Street, East 177th Street, and Bronx Park-181st Street (all side platforms except at the Bronx Park terminal, which had a single island platform). Work began on August 19, 1901. Section 10 also included a yard along the elevated structure just north of the 177th Street station. The south end of the viaduct tied into a short branch along Westchester Avenue and St. Ann's Avenue to connect to the Third Avenue El. 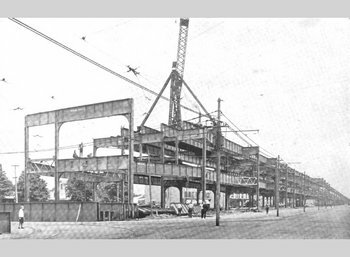 The 3rd Avenue connection was completed before the Contract I tunnel work and as such, 3rd Avenue trains began using the el structure to Bronx Park prior to the opening of the Interborough Subway. This route is an extension of the West Farms branch of the First Subway from a point near 179th street and Boston road. It is a three-track elevated line, extending easterly from the First Subway over private property and the Bronx river, and thence in a northerly direction on private property between the east line of Bronx park and the right of way of the New York, Westchester and Boston Railway, to and over Birchall avenue and White Plains road to about 241st street. The Webster Avenue extension of the Third Avenue "L" joins the line north of Gun Hill road, so that trains from the north may run south to Manhattan either over the subway line or the Third Avenue line. This line is known as Route No. 18 and is divided into two contract sections, Nos. 1 and 2. Route No. 18, Section No. 1. — This section extends from the connection with the First Subway near l79th street and Boston road to about Burke avenue. The portion of the line on private property between 180th street and Unionport road is mostly on embankment; the balance is on the usual steel structure. Oscar Daniels Company, contractor. Date of contract, December 31, 1913. Contract period, 18 months, extended to October 1, 1916. Summary of contractor's bid, $914,400. Working drawings for this section were completed prior to 1916. A railroad storage yard is being built along this section between 180th street and Unionport road. Thomas J. Buckley Construction Company, contractor. Date of contract, August 15, 1916. Contract period, 12 months. Summary of contractor's bid, $269,222.50. The contract, contract drawings and working drawings have been completed. Route No. 18, Section No. 2. — This section extends over White Plains road from Burke avenue to the terminus, about 241st street. It is a steel structure and includes the junction between this line and the Webster Avenue extension of the Third Avenue "L". Grade crossings are avoided at the connection between the two lines. A double-deck station, one level for each line, is located near Gun Hill road immediately adjacent to the point where the lines diverge. Alfred P. Roth, contractor. Date of contract, January 13, 1914. Contract period, 18 months, extended to January 10, 1916. Summary of contractor's bid, $958,484. The working drawings were completed prior to 1916. A railroad storage yard is to be built near the terminus of this line between 239th street and Baychester avenue. Thomas J. Buckley Construction Company, contractors. Date of contract, December 18, 1916. Contract period, 10 months. Summary of contractor's bid, $372,893. Contract and contract drawings for the storage yard have been completed and working drawings are under way. The contract for this storage yard is now before the Board of Estimate and Apportiomnent for approval. White Plains Road Line. Forms for railroad duct manhole between Brady and Lydig Avenues. PSC report 1914. White Plains Road Line. Steel Work in Process of Construction for Double Deck Station on White Plains Road at Gun Hill Road. PSC report 1915. 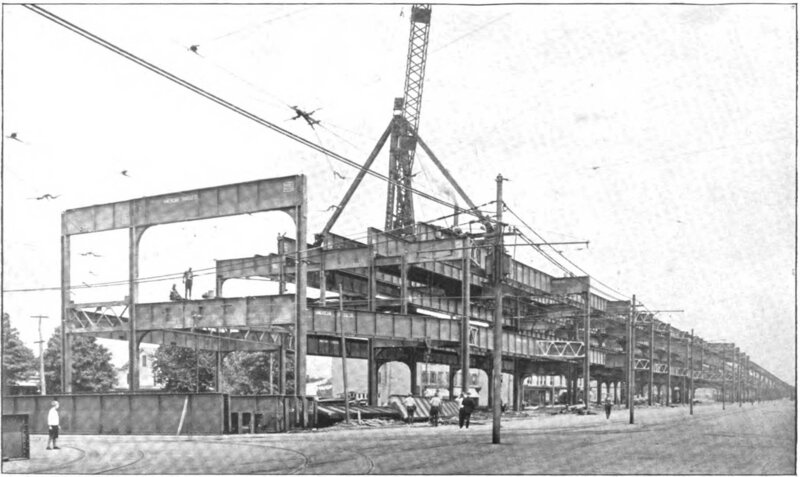 White Plains Road Line, Completed Structure Near 180th Street. PSC report 1916. 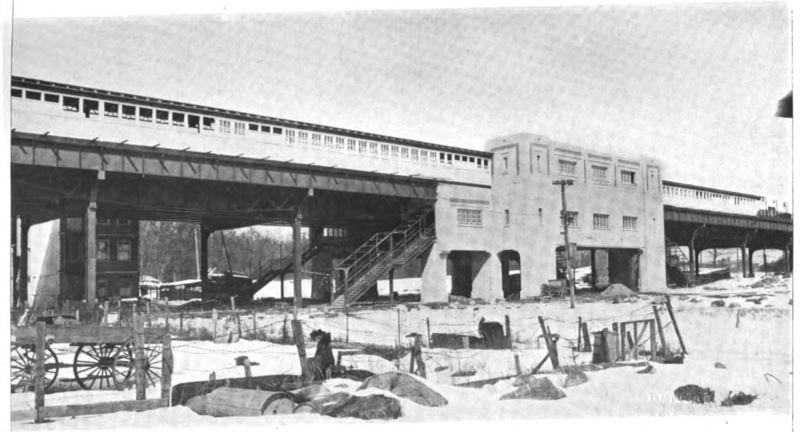 White Plains Road Line, Ornamental Concrete Station (Bronx Park East). PSC report 1916. White Plains Road Line, Structure Near Bear Swamp Road (Now Bronxdale Avenue). PSC report 1916. The Lenox Avenue branch of the subway was built as part of the original IRT route, starting from from 96th and Broadway to 145th and Lenox Avenue. Later additions were the tunnel extension to the Bronx and the 1968 extension to 148th street, the new terminal station being at grade level next to the IRT yards. At 110th Street, there is an island platform and two tracks. The fare control is at the south end of the station at platform level. There is also a high exit in the center. The station has been renovated. October 28, 1916. Dynamite Exploded in New York Subway. 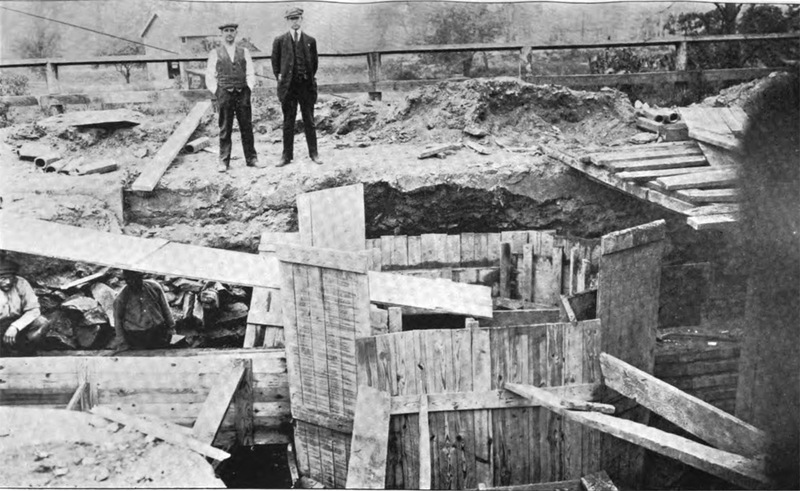 A charge of dynamite which injured two persons, tore up a rail, and blew a hole 18 in. deep in the cement bed of the track was set off at 4:37 a. m. on Oct. 25 at the southern end of the platform of the subway station at 110th Street and Lenox Avenue, New York. The police asserted that in their opinion the dynamite was set off by persons sympathizing with the strike of Interborough Rapid Transit Company employees, though they said they had no evidence to connect the crime with any individual. Of the two persons injured one was the ticket agent, who was cut by glass. The other was a [passenger] who was descending the steps of the south end of the station. November 11, 1916. Arrests Made In Subway Dynamiting Case.- Six men were arrested on Nov. 3 and accused by the police of New York of having been in a conspiracy to blow up subway stations in an effort to force a settlement of the street railway strike that would be favorable to the strikers. The short affidavit prepared at the direction of District Attorney Swann preparatory to the arraignment of the prisoners before a magistrate charged specifically that all of the prisoners, either directly or indirectly, were concerned in the placing of a dynamite bomb which exploded with disastrous results in the subway station at Lenox Avenue and 110th Street early on the morning of Oct. 24, referred to in the ELECTRIC RAILWAY JOURNAL of Oct. 28, page 947. Four of the six men arrested are said to be officials of Local No. 731 of the Amalgamated Association. The prisoners were committed to jail, in default of $20,000 bail each, for further examination. The cases of the men were set for hearing on Nov. 8, but the court put the matter over until Nov. 10, despite the protest of Louis Fridiger, representing the accused men. "They admitted that all the money they used, $190, had come from the public. You know how strikers have been going around town playing hand organs and begging. They said they got $60, $70 and sometimes $80 a day in small contributions." November 11, 1916. Financing The Bomb Squad.- "It is all beautifully simple. You give the strikers a nickel and they buy a brick with it and soak you with the brick." Thus spoke Don Marquis recently in his column in the New York Evening Sun, in satirically commenting upon the fact that striking car men in New York City were stationing organ grinders along the streets to beg financial aid from the general public. When we published Don Marquis's remarks in last week's issue, however, their truth had not been fully brought home to the public. Last Saturday four officials of the union local, a striking subway guard and a chauffeur were arrested and charged with complicity in a plot that had resulted in the dynamiting of the 110th Street and Lenox Avenue subway station on Oct. 25. Probably the most striking revelation made by the police was that the money used to buy the dynamite and carry out the plot came from the nickels and dimes taken in by the strikers' hand-organ collectors. The folly of lending financial aid in a haphazard manner to an uninvestigated, and, on its face, questionable cause, was never better illustrated. It is to be hoped that the public has learned its lesson. The Amalgamated Association officials promptly disclaimed any knowledge of the plot, but it would have been very much more to their credit if they had been responsible for its detection rather than the police, especially as they should have known what the local treasurer was doing with the money collected. The least thing which these officials can now do is to make plain to both public and police that they are co-operating to the fullest extent with the authorities in running down all who had anything to do with this dastardly outrage. November 18, 1916. Men Deny Dynamiting New York Subway.- The six alleged dynamiters of the Lenox Avenue subway station of the Interborough Rapid Transit Company, New York, N.Y., appeared before Judge Delehanty in General Sessions on Nov. 13 and through their attorney, Louis Fridiger, entered pleas of not guilty. John McCourt, the seventh man indicted, was remanded to the Tombs until Nov. 15 for pleading. March 17, 1917. Dynamiter Sentenced to Sing Sing.- Michael J. Herlihy, financial secretary of the local association organized by the Amalgamated among the New York subway employees, was sentenced on March 13 in the Criminal Branch of the Supreme Court to a term of from ten to twenty years in Sing Sing for dynamiting during the strike in New York last year. 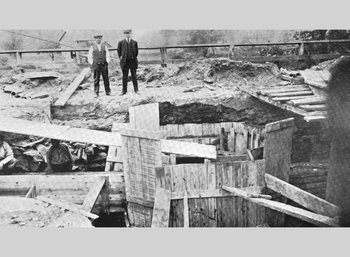 Herlihy was arrested on Nov. 3, 1916, as mentioned in the Electric Railway JOURNAL for Nov. 11, 1916, page 1034, on a charge of having attempted to blow up the Lenox Avenue subway at the 110th Street station. The dynamiting resulted in the injury of two persons. It was testified at the trial on March 8 that statements made in speeches of the labor leaders encouraged acts of violence when arbitration seemed impossible. In passing sentence Justice Tompkins said the charge was a particularly serious one because Herlihy was well aware that many thousand people constantly used the subway. Six other members of the union were indicted on similar charges. On March 14 James J. Merna and William Molsky, alias McCord, former subway guards, pleaded guilty before Suppreme Court Justice Tompkins of participation in the bomb explosion in the 110th Street station of the subway last November. Merna told Assistant District Attorney Weller they also intended to place a bomb in the subway at Times Square and had received $100 from Benjamin Hamilton, who is indicted, to buy the explosives for Times Square. Merna and Molsky were to be sentenced on March 19. Two tracks and two side platforms. The fare control is at platform level and there is no crossover or crossunder between the two sides. Renovated in 1998, there is all new wall tile along the platforms, and the "116" terra cotta wall cartouches have been restored. This and the next three stations have extensive mosaics featuring Harlem history and famous African-Americans. Two tracks and two side platforms. The fare control is at platform level and there is no crossover or crossunder between the two wall platforms. The station has a new name tablet plus some old "125" terra cotta cartouches. The tracks, trackways, and platforms at this station have been totally rebuilt during the reconstruction project to combat a water seepage problem along the Lenox Ave. subway. Two tracks and two side platforms. The fare control is at platform level and there is no crossunder or crossover between the two wall platforms. There is a new name tablet along with "135" terra cotta cartouches. Two tracks, two short side platforms. Announcements are made to exit from the first four cars. There is platform level fare control on the southbound only. The northbound side has only a high exit. Evidence suggests that at one time there was a northbound booth. Terminal station with two tracks and a single island platform. This station is on the surface located adjacent to the IRT Lenox Yard, but it has an underground feel due to apartment housing being built on top of the yard and station. The station opened May 13, 1968 and provides a view across the river to Yankee Stadium to the northeast. The fare control is located above the north (west) end at street level, and there are doors in between the street, station house, and platform. The lighting is mercury vapor style, and there is an active tower and crew quarters on the southbound platform. This was the first IRT station, and in fact first subway station, in the Bronx. This station is now two levels, with the original line station on the lower level and a newer, Dual Contracts-era station above serving the Woodlawn IRT line. The lower level, which has a high, rounded ceiling like 168th Street on the West Side IRT, and featured low crossovers at the south end of the platforms. The overpasses have been closed for safety reasons but when they were open one could see the track merger between the East Side and West Side lines into Manhattan (5 and 2 trains, respectively). This station had bi-level elevators to a mezzanine (now closed) above the upper level. The elevators had "stops" on the crossover level and the platform level. The upper level is perpendicular to the lower level and has mosaic directional signs as well as a mosaic sign to the New York Central Lines. This station was at one point called Mott Avenue. This station has been fully renovated and now includes elevators and platform level fare control on each of the two wall platforms. There is no crossover or crossunder. Each platform has a bus transfer booth with separate fare controls; the bus transfer was used for the connection to the Bx-55 bus which replaced the 3rd Avenue El in the Bronx. The extra booths and turnstiles, while still present, are no longer in use, having closed in July 1997 when the Metrocard Gold free transfer policy went into effect. The tile has dark red and dark green/gray lower accents and dark red upper border. Prior to the renovation, terra cotta "3" plaques were on the platform walls. One of these has been preserved at the Transit Museum. We now ascend to elevated structure for the trip to East 180th St. This is the longest section of elevated built under IRT Contract I. Rising to the El level you can still see the shortened supports for the Third Avenue El line which was once above us. All stations before East 180th St. have two wall platforms and three tracks; the center track is used for service diversions and the peak direction express service. All of the stations have ornamental designs on the railings and stairs. With the exception of 177th St. and Intervale Ave., none have crossunders. At Jackson Avenue, the station has a short canopy at the station house only. Fare control is on the southbound side only with iron maiden turnstiles on the northbound side. There are old signs, now covered up, and a closed station house on the north side, which has old plywood walls and floors. The station has escaped the windscreen treatment common at other elevated stations. The southbound has doors from the stationhouse to the street and a partially removed old token booth overlooking the southbound platform. Three tracks and two side platforms. There is windscreen the full length of the station's platforms and a center canopy over the fare control on each platform. The station has doors to platform and street and has heaters which appear to be steam heaters (flue pipe found). The northbound station house has the rear of the old booth gated off and the front painted over. Three tracks and two side platforms. At one time this station was called 163rd Street. The station was totally rebuilt in 1992 after a fire destroyed the old station. The old station had a wood mezzanine and wood floor. The token booth clerk died in the fire after leaving the booth (which had fire protection). The new station is out of character with the line and has a crossunder. The new mezzanine is metal as is the canopy and windscreen. The stair walls and mezzanine have an embossed leather look. The floor of the mezzanine is concrete. The mezzanine has glass block windows and escalators to the street. Three tracks and two side platforms. Similar to Prospect Avenue. The station house has a concrete floor and has doors. A glass block elevator tower is off to the SE and NW of the station. There is a 10mph curve just north of the station. Three tracks and two side platforms. Resembles the other stations along this stretch of line. The station also has heaters, wooden mezzanine and floor and an open old booth like at Simpson St.
Three tracks, two side platforms. This station is built on a curve which results in a large gap between center doors and the platform. The gap is almost wide enough to need gap fillers. West Farms Sq.-East Tremont Ave.-177th St.
IRT White Plains Road Line at West Farms Square. Fan trip train entering the station southbound. Photo by: Dante D. Angerville, December 2004. Three tracks and two side platforms. This station is very high and has escalators to the street. Northbound, there are two extra exits that the other stations along this line don't have. The wood mezzanine has a rubberized floor and textured frosted glass windows. Just north of the station you can see the three abandoned trackways to Bronx Park, the original terminal of this line. IRT White Plains Road Line at East 180th Street. Architectural detail of NYW&B Building. Photo by: David M. Kelly, 2007. Leaving East Tremont Ave., we turn eastward and enter the S-curve to East 180th Street Station. This station has two island platforms and three tracks. The south end of the platforms has a staff-only bridge allowing access from the two platforms to the yard directly to the west. Current track usage has through trains on the outside tracks (including Dyre Ave. thru service). The center track, which can be accessed from either platform, is used for off-hours Dyre Shuttle, short-turns, and special service. Shuttle trains will often open doors on both sides of the train, a rarity in NYC Transit. The only other location that this is common is Main Street on the Flushing #7 line. Until the 1980s, the East 180th St. Station had escalators to street level via a mezzanine, which has been removed. A walk under the tracks will show where the original mezzanine was located. The subway station is adjacent to the East 180th Street Station of the New York, Westchester, and Boston Railway. The stationhouse building, which served as the NYW&B's headquarters, was restored by Citnalta Construction Corporation following a design by Lee Pomeroy Associates and Weidlinger Associates architects. The restoration was completed in January 2013 at the cost of $66 million. The building features stucco walls, a clay tile roof, and detail statutory featuring the Roman god Mercury. Originally built in 1912, the building was designed by Alfred T. Fellheimer, who, as a partner in the firm Reed and Stern, had helped design Grand Central Terminal. The structure is now listed in the National Register of Historic Places. Today, the building still serves as a railroad headquarters of sorts: MTA New York City Transit employees work in offices in the upper floors. The restoration of the building returned a clock to its original position under the head of Mercury, and made the station compliant with the 1990 Americans With Disabilities Act. The primary entrance and exit from this station is through the NYW&B stationhouse. From the street, passengers approach the stationhouse via a landscaped plaza. A second exit leads to 180th Street. Between the subway station platforms and the NYW&B stationhouse, are platforms formerly used by the NYW&B railroad. The trackways of this station are now used for train storage. After the NYW&B ceased operation, the tracks and platforms here were used for Dyre Avenue shuttle service, before the line was fully connected to the subway system. To the west of the station is the East 180th Street Yard and Maintenance Shop. The shop complex underwent major renovation in preparation for servicing the R-142 cars in 2000. To the northeast is the Unionport Yard (see East 180th Street Yard) and a signal tower. Just to the northwest of the station is the flyover connection from the southbound track of the Dyre Ave. branch. North of East 180th Street on the main line is Dual Contracts construction. All of the Dual Contract stations to White Plains Road have crossunders. At Bronx Park East there are three tracks and two side platforms. Old signs are located at the center exit stairs and have been painted over, but the signs on the southbound platform are bleeding through the paint. Covered windows in the concrete wall are also present. The tile mezzanine has windows and standard "Uptown" and "Downtown" mosaics. The mezzanine itself is made of stucco over concrete and is massive. The station resembles those on the Queens Boulevard portion of the Flushing line. To the east is a view of the Dyre Avenue line. Renovated in 2005. Three tracks and two side platforms. The platforms have windscreen along most of their outside edges, only the south end escapes. The mezzanine is built like the one at Bronx Park East. A view over the south end railings reveal the station originally had low concrete walls and windows, here again bearing resemblance to the Queens Boulevard stations on the Flushing line. The station still has old lights on the platform but I expect that they will soon be gone. Evidence shows a removed old sign near the south exit to the south mezzanine. A reader of these guides wrote: To harmonize better with the wide parkway over which it was built, the entire exterior of the station was stuccoed. This included extra (possibly structurally unnecessary) supports along the sidewalks (in addition to the plain steel supports down the White Plains Road pavement). These stuccoed supports effectively hid the steel supporting structure from parkway strollers and motorists. Renovated in 2005. IRT White Plains Road Line at Allerton Avenue. Photo by: Frank LeViness, June 2005. Three tracks and two side platforms. There is a wooden mezzanine with windows outside the fare control and an extra exit on the southbound side. The station is very plain, the only ornamentation or color being the window sashes and mullions. (Mullions are the dividers in the window while the sashes are the outside of the window. If you think of it as a tic-tac toe board with a frame around it, the frame is the sash and the board the mullions.) Allerton Avenue was renovated in 2005 and in fact was closed for a few weeks leading up to May, 2005 to accommodate the work. Three tracks and two side platforms. Resembles the other stations along the line. Renovated in 2005. There are extra exits on both platforms (compared to the other stations on this stretch). Three tracks and two island platforms (express configuration), on the upper level which serves the White Plains Road Line. There are two trackways and a disused island platform on the lower level which formerly served the 3rd Avenue Elevated Line. The lower level has been abandoned since the termination of El service in 1973. The lower level mezzanine is visible behind a gated area. Down one more level to the street is the main station house. North of the station is a junction between the two levels, with the lower level trackways rising in between the outer tracks and inner express track, (making a five track/trackway line for a short distance: from west to east, they were as follows: main southbound, 3rd Ave. southbound, main center, 3rd Ave. northbound, main northbound). Old signs on the lower level are still visible from the windows of downtown trains arriving into the upper level station. Renovated in 2005. Three tracks and two side platforms. Similar to other stations along the line. Renovated in 2005. There is a mechanical room under the northbound platform's north end and is reached by steep work stairs which are grilled off. Three tracks and two side platforms. Similar to other stations along the line. Renovated in 2005. Three tracks and two side platforms. Similar to other stations along the line. At the north end of the station the northbound track begins to ascends to pass over yard leads, while the others descend. A three story tower is located north of the Station which has an old blue and white letter sign "Warning -- Do not lean over edge of Platform". North of this tower two yard tracks enter the line. Renovated in 2005. Two tracks and an island platform in use, with two disused side platforms; terminal station. The bumper block is at the north end of the station. Signs on the outside platforms warn the conductor, "Do not open this side." These platforms are used for storage. Renovated in 2005. Two side platforms along four tracks (center two disused). The north end of the station is in a short tunnel under the cross streets and station house. The south end is open to the sky with no windscreens and a short concrete wall along the sides. The walls along the canopy have a cityscape pattern. The station house is built in a southwestern style with rounded clay tiling on the roof and beige paint reminiscent of adobe. There is a crossover between directions and a small fare control area, with doors to the street. The mezzanine has arched windows and heaters. The booth is surrounded by red grillwork which is locked during overnight hours. At that time entry is via "iron maiden" turnstiles. From here to Dyre Ave. you can see the concrete bases which once held catenary towers at various points. Originally an express station along the NYW&B, this fully underground station has two island platforms. The service tracks are along the outer wall. The inner trackways have had the rails removed, with only the ballast remaining. There are some old lights in the center of the high ceiling which are inoperative. The exit is to the south end and the platform has a severe taper at that end. The station exits into a small park area on street level. 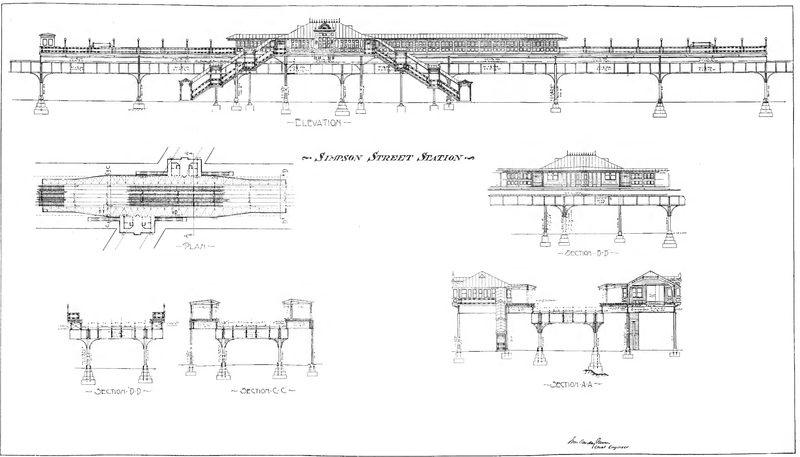 The design here is similar to Morris Park, with a station house at the north end, canopies along the platform, and short concrete walls at the south end. The canopy walls have a similar cityscape design as well. The fare control is over the tracks at street level on the north end. There is an extra closed exit from the northbound platform's north end apparently leading to the fare control but no evidence was found upstairs for this stairway, leading to a theory of a high exit in the "second mezzanine". This station has three tracks, with the northbound express track having been removed. Two tracks and two side platforms. Resembles Gun Hill Road in design with and platform windscreen resembling Morris Park. The cityscape scene along the canopy is being replaced with solid beige walls. In an interesting layout, the fare control is under the tracks at the north end, 48 steps down to street level. Two tracks and a single island platform. In the NYW&B era this station had four tracks and two side platforms. The current arrangement has the northbound "local" track and southbound "express" track in use, with the island platform over the northbound "express" trackway. The southbound "local" trackway is clearly visible at a bridge over the street. North of the station the tracks continue a short distance to the bump block. A tower is over the south end. Remnants of the original side platform are visible midway along the center platform. The fare control is at street level, 37 steps down from the platform, at the south end. Bernard Linder, "IRT Broadway-7th Avenue Line Opening Dates and Schedule Changes," December 1990, New York Division E.R.A.